Finding your lawn riddled with bare brown patches, dying areas and a generally chewed up look is discouraging. Fortunately, once you identify what insects are eating your lawn, you can keep these common pests under control without damaging the ecosystem. Grass (Poaceae) grows in U.S. Department of Agriculture 2 through 11 depending on the variety. A close-up of a cutworm. When you find large, up to 2 inches long, brown-colored caterpillars chomping on your grass, you're likely dealing with armyworms or cutworms. These grass-eating caterpillars cause irregular patches of dead-looking grass in the lawn. Look for dark brown, black, bronze or pale green caterpillars (there are several species of both armyworms and cutworms) at the edge of the damaged lawn area. For identification, you can flush them out by pouring 2 gallons of water mixed with 1/4 cup of dish soap -- pick the lemon scented variety -- onto the area. Sod webworms, lawn moths at the larval stage, eat grass at night. Mature sod webworm larva grow 3/4 to 1 inch long and look gray or pale brown. 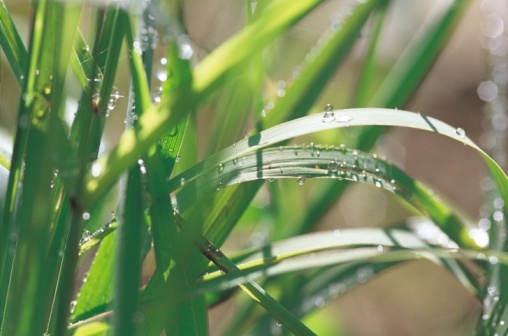 Keep an eye on any irregular brown areas in the grass from spring through fall. If you see pale brown 1/2 to 3/4 inch long moths flying near the surface, check the soil for sod webworms. 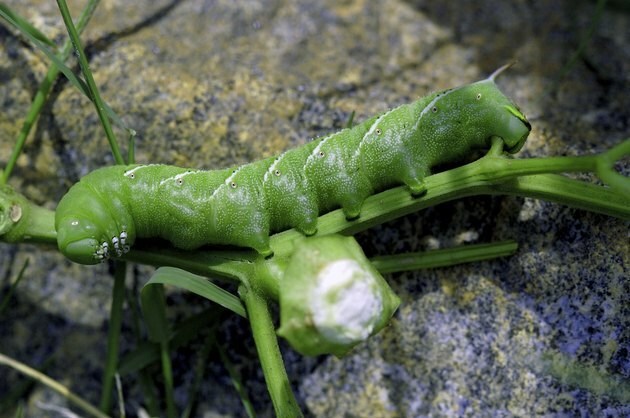 While the moths don't actually eat grass, the larva will eat and even kill areas of the lawn. White grubs feed on grass roots. Eventually they turn into one of several beetle species including Japanese beetles and June bugs. If the grass looks dead and wilted in any area of the lawn try lifting the sod. If it comes up easily, it's likely that white grubs have damaged the roots. When you lift the sod, you should see white larva curled up on the soil surface in the shape of the letter C.
Billbug larva eat grass and then turn into beetles that also eat grass. The larva will eat the blades, the crown and the roots, causing general destruction. If you see dead patches in the lawn, usually in mid to late summer, and a substance that looks like sawdust around the base of the grass blades, you're likely dealing with billbug larva. The larva are off-white with a brown head. Pull up a small section of turf and look for the curled larva on the soil surface. Treat armyworms, cutworms, sod webworms, white grubs and billbug larva with beneficial nematodes. These tiny beneficial worms attack and kill lawn-eating pests without posing a danger to people, animals and beneficial insects. Use the species Steinernema spp. to treat armyworms, cutworms and bill bugs and sod webworms. For white grubs look for Heterorhabditis spp nematodes. Use 5,000 nematodes per 1,600 square feet of lawn. To apply, empty the package into a standard watering can and then fill it with water. Stir in the nematodes and then sprinkle the water onto the area you are treating. The volume of water to nematodes is not important as long as you can thoroughly dilute them and spread them over the area you want to treat. Treat the lawn in the evening when the soil temperature is at or above 60 degrees Fahrenheit. Repeat the application seven to 10 days later if the problem persists. Nematodes take three to four days to start working.